In Jess Montgomery’s THE WIDOWS (MintaurBooks), it’s Kinship, Ohio, 1924. It’s Lily Ross learns that her husband, Daniel Ross, the town’s widely respected sheriff, is killed while transporting a prisoner, she is devastated and vows to avenge his death. Inspired by the true story of Ohio’s first female sheriff, this is a powerful debut about two women’s search for justice as they take on the corruption at the heart of their community. Have to love a novel with rich, strong female characters. Get ready to a wild ride! This is the first book in the Kinship series. We Got the opportunity to chat with Jess about her new novel. THE WIDOWS is inspired by a true story …. tell us what interested you to write a novel? The inspiration for THE WIDOWS is Ohio’s true first female sheriff, Maude Collins, in 1925. She was asked to fulfill her husband’s term after he was killed in the line of duty during a traffic stop. In 1926, she was re-elected—in a landslide—as sheriff in her own right. Of course, this is a fascinating story, particularly for a woman in law enforcement in that era. But there is not any mystery to her story. There was no doubt as to who killed her husband—plenty of witnesses saw the tragedy take place. I’m a story-teller, so soon after I learned of this true story, I started wondering… what if? What if a sheriff was murdered, but no one bore witness? What if his wife was told that everyone thinks he was killed by a prisoner he was transporting, and the prisoner ran off? What if, knowing her husband as well as she does, she finds this highly unlikely? What if she then agrees to fulfill his term as sheriff, but in order to investigate on her own his murder? What if she’s faced with a difficult choice: justice for her husband (and personal vengeance) or justice for her community? As I contemplated all of those questions, Lily Ross—inspired by but wholly different from the true-life Maude—emerged as a compelling character. Your novel delves deep into what is social justice? Is achieving social justice that much different from the time of your novel, to today? I think social justice questions—about individual rights, respect for individual humanity, and community needs—are part of any era in any time. How those questions play out, or are answered, shifts continually depending on the circumstances of time and place. In THE WIDOWS, for example, the coal miners clearly want, and need, safer working practices and fairer wages. The owner of the coal mining company argues that allowing unionization and making these changes will cut into company profits—a selfish-sounding argument, but he would say that cutting profits means fewer jobs and hurts the community. And yet, the community is clearly suffering because of deaths and injuries related to unsafe coal mining operations. My father was a union leader, and so I am supportive of unions. But these particular questions are tricky and complex, and mirror Lily’s own conflicted feelings about her individual wishes and her community’s needs. What interests you about writing historical mysteries? I’m fascinated by any overlooked, quirky or unusual bit of history. Historical fiction gives us the chance to not only look back, but to look at where we are—and where we’re headed—through the lens of past experiences. And I love the suspense and puzzles of mysteries. So the combination for me is irresistible—both as a reader and a writer! Your books have strong protagonists. Why is that important? I love to read about strong protagonists, particularly strong women. The strong women from father’s side of my family of origin served as inspiration for me—and for many of the supporting female characters in THE WIDOWS. My female friends are all strong women who I greatly admire. Being strong doesn’t mean being perfect, or indomitable, or unbendable, or even tougher than everyone else around you. It does mean squaring your shoulders in the face of adversity and finding the courage to continue on even when it’s tempting to simply sit down and give up. But who does that really help? So I love to write about women who are strong because they find strength, again and again, to go on in challenging situations—and come out of the experience not just stronger as individuals, but stronger in relationships and in their communities. You love to bake pies. What is your favorite pie and can you offer us a special recipe? Delicious! I’m heading into the kitchen now to do a little baking. JESS MONTGOMERY is the Literary Life columnist for the Dayton Daily News and Executive Director of the renowned Antioch Writers’ Workshop in Yellow Springs, Ohio. Based on early chapters of The Widows, Jess was awarded an Ohio Arts Council individual artist’s grant for literary arts and the John E. Nance Writer-in-Residence at Thurber House in Columbus. She lives in her native of Ohio. I love being reminded of true life events that occurred during that particular time period. An author can paint a vivid picture of events that make that time period come to life again. I’m not a big history buff but when I read a historical fiction book I become interested and learn so much! All the little facts that are included. It’s the best way to learn. I appreciate history because it teaches you about past events and people and the outcome of their story. 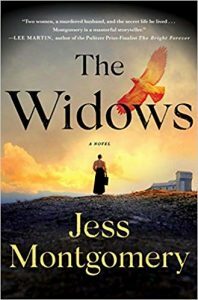 I would love to read THE WIDOWS. I see that it took place right here in my home state. I love historical fiction because it take me back to other time periods and I learn interesting facts. I get to live vicariously in a different time period through the characters in the book. I appreciate the struggles they seemed to encounter in comparison to today. Historical fiction has taught me many things including things that have really happened and I had no idea. Historical Fiction books are so interesting! Looking forward to this one! Thank you for the opportunity! I love that I can actually experience the different period of time in a different world. It is an unique journey every time and I specially love when it is inspired by true story. Historical fiction is a captivating escape which gives me the most enjoyment because it is meaningful and memorable. I like reading historical fiction because I always learn something new about the time period featured in the book. I love learning through historical fiction. Especially the WWII era and early American history. I’ve learned so much more about the Holocaust and WWII than I ever learned in school. I love learning about the way people lived. I love reading about how different life was back then. It seems like it was simpler and easier. Historical fiction is a great genre when you can be transported to another time & place and learn about that period of time in the process. To me, historical fiction is like a double dipped icecream cone. One layer of good reading, coated with actual learning! Best example ever us reading some of Lisa Wingates Seakeeper novels and learning about the Melungin culture in the process. I appreciate historical fiction because it enables me to enjoy learning history rather than feel like I’m reading a history book. However, although I would like to read this book, I will have to remember what the author said: this was inspired by a true story but significantly changes the true story. I appreciate learning about people and cultures of different times and places. I enjoyed history as a subject in school, and reading these novels puts a human and realistic perspective on our past. I love learning new and interesting tidbits.